I went for a run today! NBD, except the last time I ran was wayyy back in the beginning of March. A couple of big hikes left my knees feeling pretty achey, so I've been doing a lot of swimming and other low impact workouts lately. Today's run wasn't exactly planned. 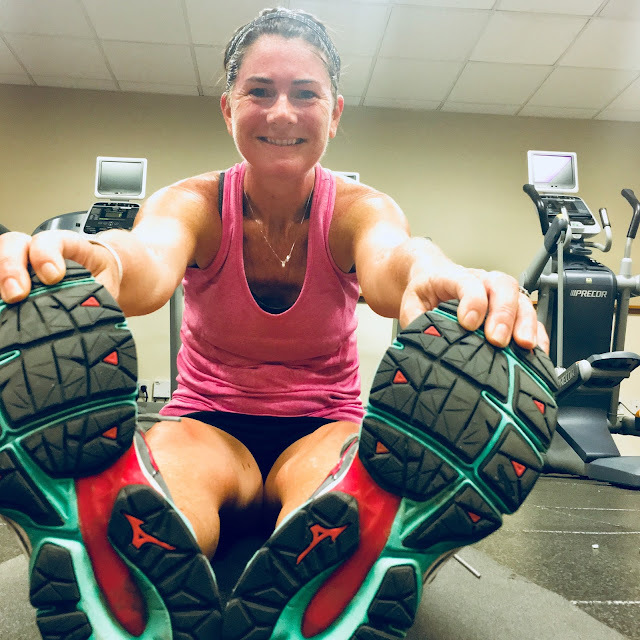 When I was packing for our current trip to the US, I packed some fitness gear for swimming, yoga, hiking in Boulder and the possibility of a run or two. My knee has been very happy with the break from the pounding it takes while running, so going for a run wasn't super high on my list. Sad, but true. I made the choice to bring my wave horizons because they are pretty multi-purpose. Bringing my running shoes turned out to be a good decision. 1) The hotel fitness options are pretty poor. 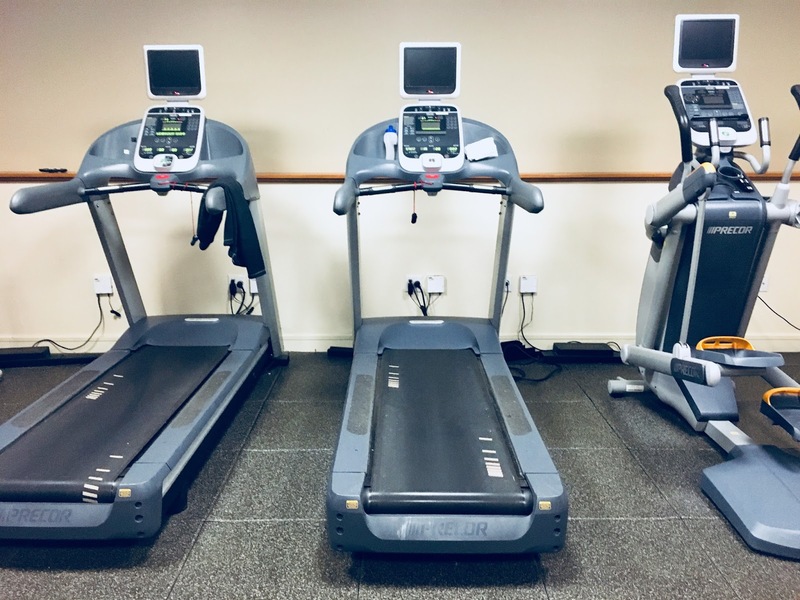 The small swimming pool is closed for maintenance and on my first trip to the fitness room I was disappointed to find that 2/2 treadmills were not working. Today I was fully expecting to do another elliptical workout, but was surprised to find one treadmill operational. I didn't waste a second getting on that thing. 2) Since the treadmill faces a wall, I opted to listen to music rather than mess with the built in TV. I went with a playlist called Grrl Power 2 from Rock My Run to listen to while I ran. I used it during my first Reach the Beach relay and it has stayed one of my favorites. 3) Intervals seem to keep my knee happy, so I stuck with what works: run 4 minutes, walk 1 minute. My interval timer was programmed for 8 sets, but I stopped after 7 when I had reached 3.14 miles. My legs felt kind of awkward at first but eventually they loosened up. I was running pretty slowly (5.0 then I bumped up to 5.2), but it's not about that anymore. It's about what makes my knee comfortable. This run made me realize that I miss running. I like that my knee has been happy, but I'm not quite ready to hang up my running shoes yet. For now I will focus on getting ready for my next official race: the Queen Bee 4 Miler in Cincinnati in the fall. Do you use hotel fitness centers when you travel? Yay for a run! When I travel, I research places to run and take it outside! I love to explore new places on foot. I use Spotify for all my playlists--I love being able to change them up. I usually find a route outside too, but this hotel is just in a bad place for runners. No sidewalks and a really, really busy road. Plus it's A LOT colder than I realized, so I'm unprepared for outdoor runs at the moment. Hoping that changes when we get to Delaware. Im glad you got to run! When I travel I either use fitness centers or run outside- it just depends on the location. So true, this location happens to be not great for running outside and my lack of cold weather gear is keeping me inside too. I didn't plan well for this extra cold weather!